According to Prue Leith, fellow Bake Off judge Paul Hollywood is a “squishy, lovely man” but – shock, horror - doesn’t make his own Technical Challenge creations he shows off to her during the show. Talking to a rapt Town Hall audience, the chef, cookery school entrepreneur and grande dame of the Great British Bake Off tent revealed that they had a wonderful home economist called Rebecca who makes all the bakes for the middle trial of the Channel 4 show. “She can bake anything, and she makes those, along with all the food for the crew during filming. Everyone is very well fed, and they still want to eat the bakes made by the contestants afterwards!” she laughed. 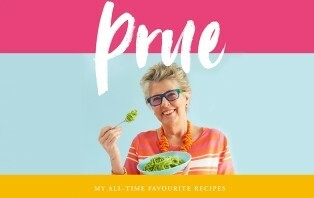 This year Prue celebrates a lifetime of cookery with her first cookbook in 25 years, Prue: My All-time Favourite Recipe. Well, not quite a lifetime. As a child growing up in South Africa, Prue admits to leading a sheltered existence with her company director father (he ran a company that made, among other things dynamite) and famous actress mother. It wasn’t until she moved to Paris as a student and au pair that she was introduced to cooking, staying with a family who cooked everything from scratch and sat down to proper family meals every day. “We all ate sitting round a table and after that I always felt food was about coming together convivially as much as it was about nutrition,” she said. Since then Prue has championed good food, whether it is being taught to students at her renowned cookery schools or served as school meals, an area in which she has varying degrees of success. But her star really reached its ascendancy when she joined the cast of the GBBO as a judge alongside Paul Hollywood. This year sees her second series and she is revelling the attention it brings. Prue Leith appeared at Cheltenham Literature festival in October 2018. Review by Helen Gadd.